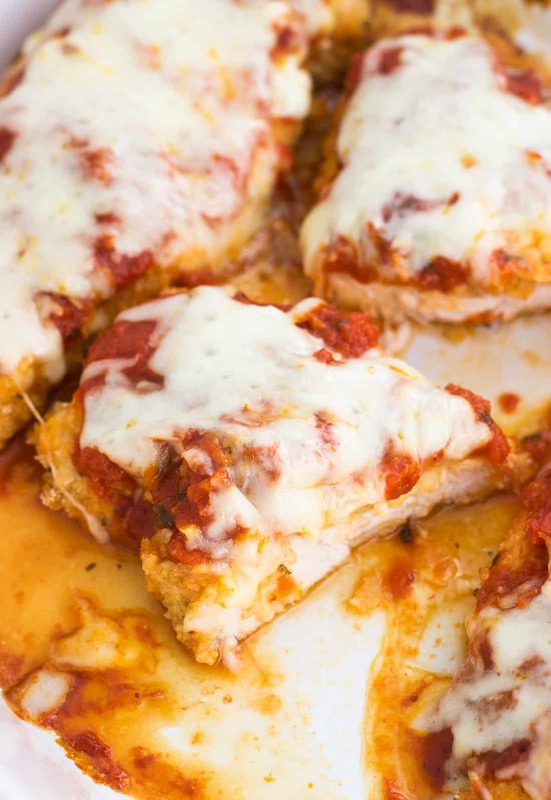 Easy Baked Chicken Parmesan is a quick and satisfying meal made better for you. 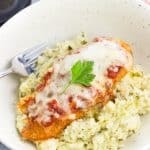 This healthy chicken parmesan recipe is so simple to put together and done in just around 30 minutes. It’s hard to beat comfort food like this. I’m not one to make resolutions, but if I was, I’d have to say maintaining an Instagrammable refrigerator and pantry (for more than half an afternoon…) would be one of them. Have you seen some of these well thought-out and expertly organized fridges, freezers, and cabinets? Big ups to the foodies who can spruce up their kitchens to the next level like that. I have serious doubts that the inside of my fridge and my pantry shelves will ever be neat enough for me to willingly share a photo to thousands of people on the internet. Time to work my way through that accidental stockpile, no? After all, you don’t have to twist my arm for me to cook Italian food. Yes, this baked chicken parmesan recipe is a way to use up jarred marinara, but really shines as a better-for-you version of Italian comfort food. First let’s talk about what chicken to use. My first choice is to use chicken cutlets, which are smaller cuts from chicken breast. Since they’re thinner than chicken breasts, they cook quicker and provide a nice and balanced ratio of chicken vs. toppings, especially in the case of this baked chicken parm. 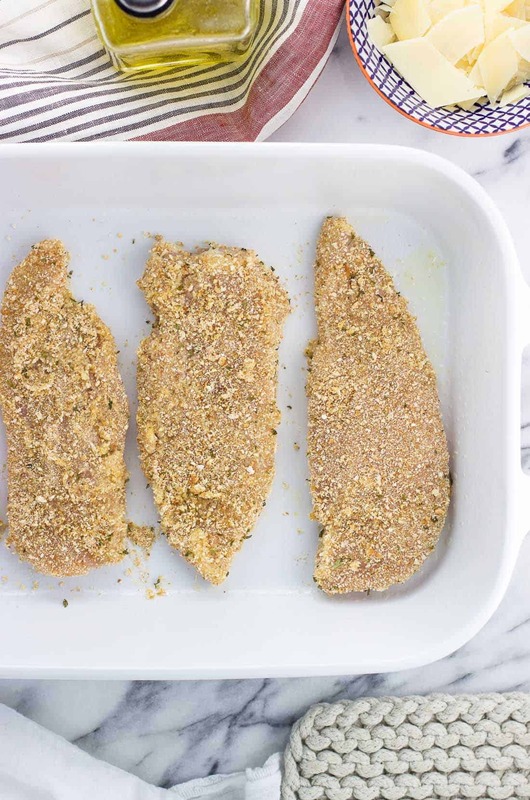 If you can’t find chicken cutlets or would rather use up what you have at home, you can certainly make your own cutlets from boneless skinless chicken breasts. Slicing the chicken breast in half horizontally should do the trick. Keep in mind that chicken breasts can come in a huge range of sizes, so you may even need to slice some large ones more than once. The big thing is that you want all of your chicken cutlets to be of the same thickness so they cook evenly in the oven. 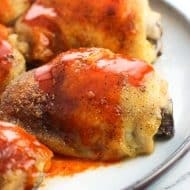 Right from the start we’re taking a big deviation from more traditional chicken parmesan recipes in that we’re baking this chicken, not frying. 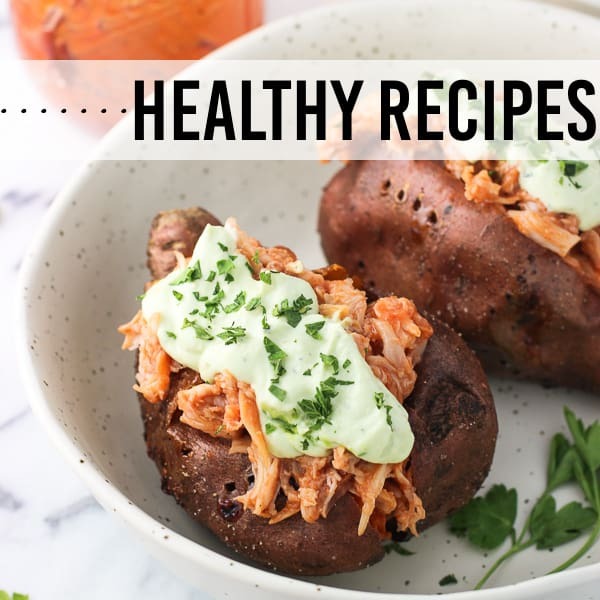 Of course I think pan-fried chicken parmesan is delicious, but I appreciate a healthier shortcut for weeknight meals we eat regularly. With all the cheese and marinara sauce going on, the breaded and baked chicken is more than fine. 🙂 Plus one less pan to wash! Each cutlet is dipped in an egg/milk mixture and then in Italian seasoned breadcrumbs. I added a little extra garlic powder to the breadcrumbs to bump up the flavor, but you do you. 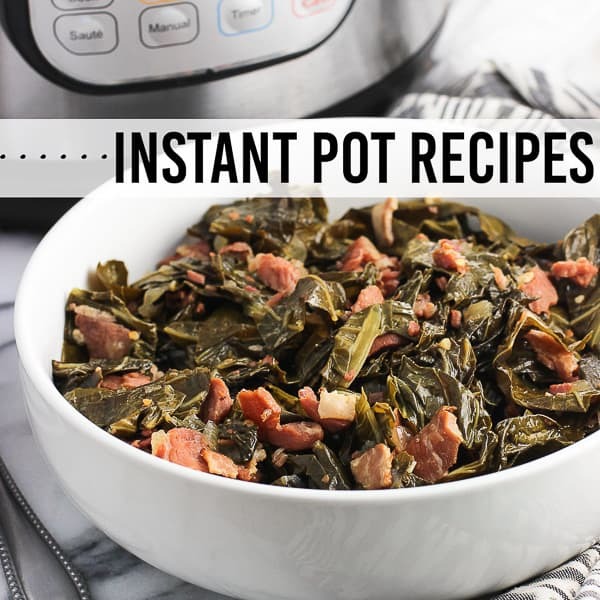 You can also use regular breadcrumbs and season them to your liking with garlic powder, onion powder, dried basil, dried oregano, dried parsley, crushed red pepper flakes, salt, pepper, etc. Once dipped and breaded, into the oven they go! Since the cheese won’t need too long in the oven to bake, the breaded chicken cutlets do the first half-ish of their baking without any toppings on them. 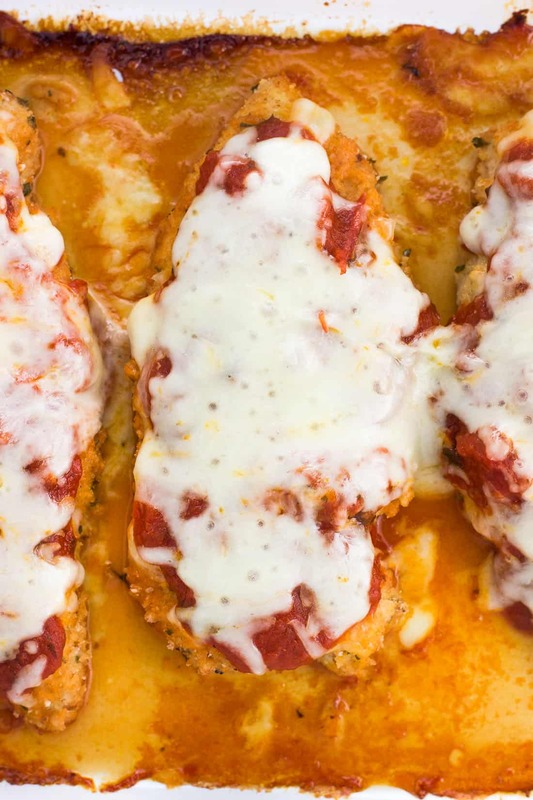 At the baked chicken parm half-time, you’ll place a layer of shaved parmesan cheese over top of each cutlet, followed by marinara sauce and then shredded mozzarella cheese. 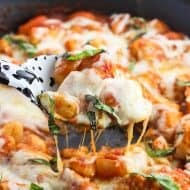 Gooey and melted mozzarella is a must in any mental image of chicken parmesan, but often the parmesan gets overlooked. 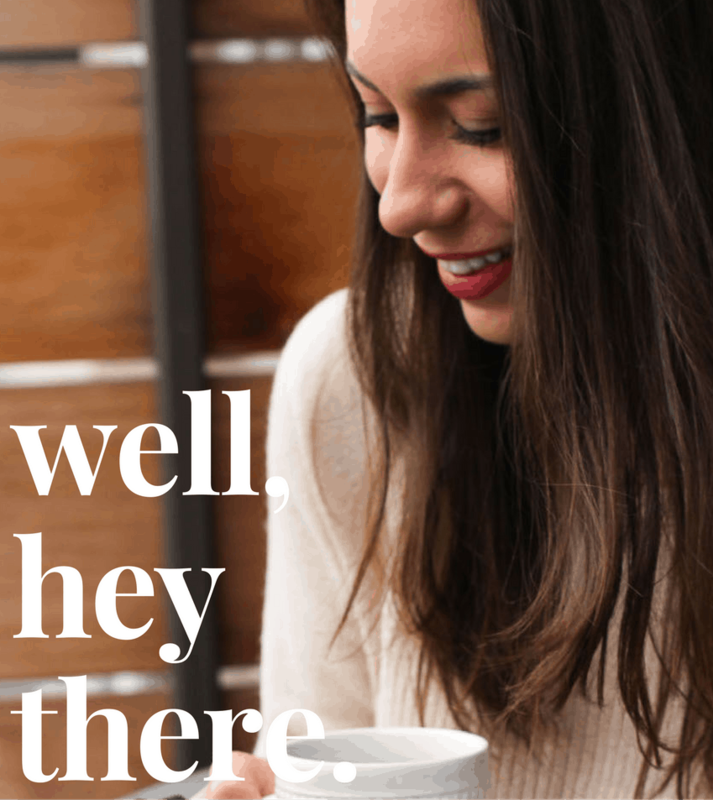 I mean…it’s called ‘chicken parmesan’ after all. 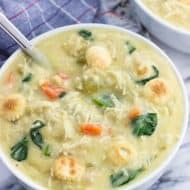 I find shaved parmesan right next to the grated and shredded parmesan (you can see it in the very first picture in this post), and love how the larger pieces melt into the chicken. You can also use grated/shredded parmesan if you like for this step. Everything goes back into the oven for the cheese to melt and the chicken to cook fully. 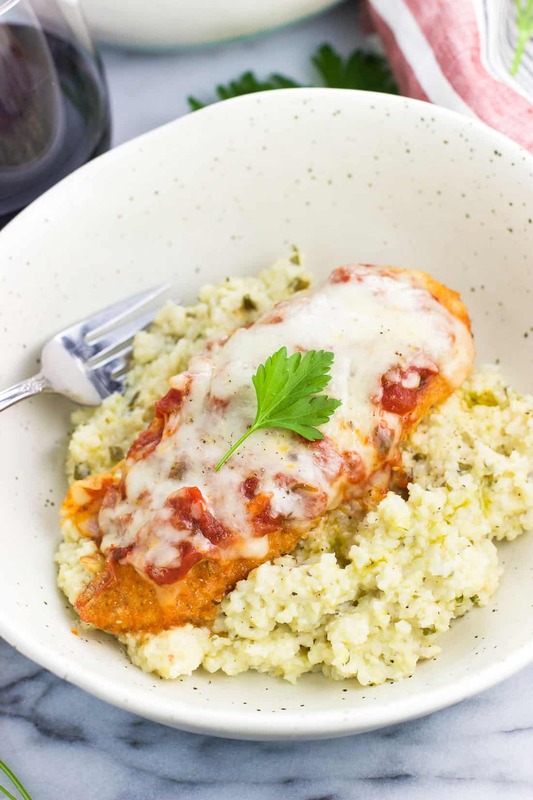 Top with fresh Italian herbs if you like and this chicken parmesan recipe is all set for your dinner table. 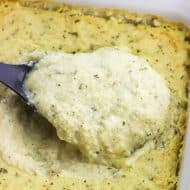 Italian herb and cheese baked grits, which are what you see this baked chicken parmesan served over in the first picture in this post. Parmesan pesto cauliflower rice, for a low-carb and healthier side dish. Pesto broccoli rice, to the keep the lighter theme going. Marinated caprese salad with kale, for a hearty and Italian-themed leafy green salad. I usually find chicken cutlets in approximately one-pound packages, and use two packages for this recipe. 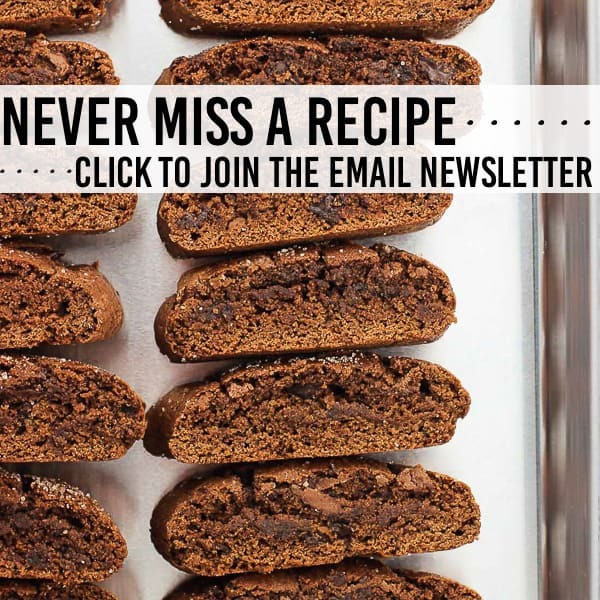 The recipe is fairly easy to halve if you’d rather just use one package. If slicing chicken breasts into cutlets, be mindful of each piece’s width. You want each cutlet to be around the same thickness so that they cook evenly. Grated or shredded parmesan cheese can be used instead of shaved. An instant-read thermometer takes the guesswork out of cooking chicken to the correct internal temperature (165°F). I seriously don’t cook meat, prepare warm water for yeast doughs, or make homemade candy without it. Easy Baked Chicken Parmesan is a quick and satisfying meal made better for you. 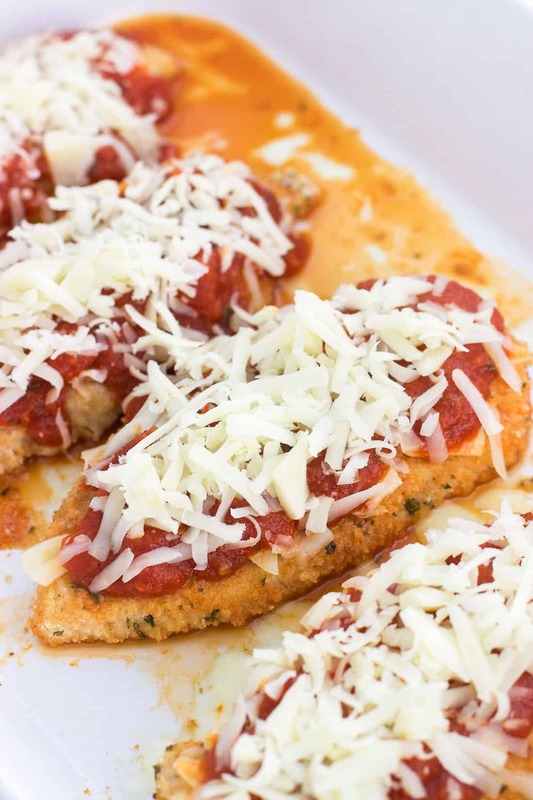 This healthy chicken parmesan recipe is so simple to put together. It's hard to beat comfort food like this. Preheat oven to 400°F. Spray a baking sheet or baking dish with cooking spray and set aside. Add eggs and milk to a shallow bowl and whisk until combined. Stir together breadcrumbs and garlic powder in a separate shallow bowl. Dip each chicken cutlet in the egg mixture, then press into the breadcrumbs to coat both sides completely. Place breaded chicken cutlets equally-spaced apart on prepared baking sheet. Bake for 10 minutes, then remove from the oven. 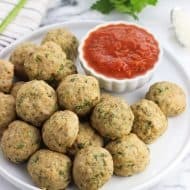 Evenly scatter the shaved Parmesan over top of the chicken cutlets, then cover with the marinara sauce (about 3 tbsp per cutlet). Top each cutlet with shredded mozzarella. 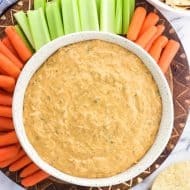 Bake for an additional 10-12 minutes, or until chicken is fully cooked (no longer pink and the center of the thickest piece reaches 165°F). Garnish with Italian herbs like basil, parsley, etc. The cook time listed in this recipe is for store-purchased cutlets, and not ones I cut down from breasts. Since thickness (and cook time) can vary, check to see that your chicken is done when no longer pink inside and the temperature in the thickest part reaches at least 165°F.